Have you ever tried Facebook Status from Different devices ? We usually observe that some of our friends update their status in Facebook from different devices like iPhone, Blackberry, iPad, Android and Etc. But have you ever tried to fool your friends by updating your Facebook status from different devices with single application? If not, you have to read this article. 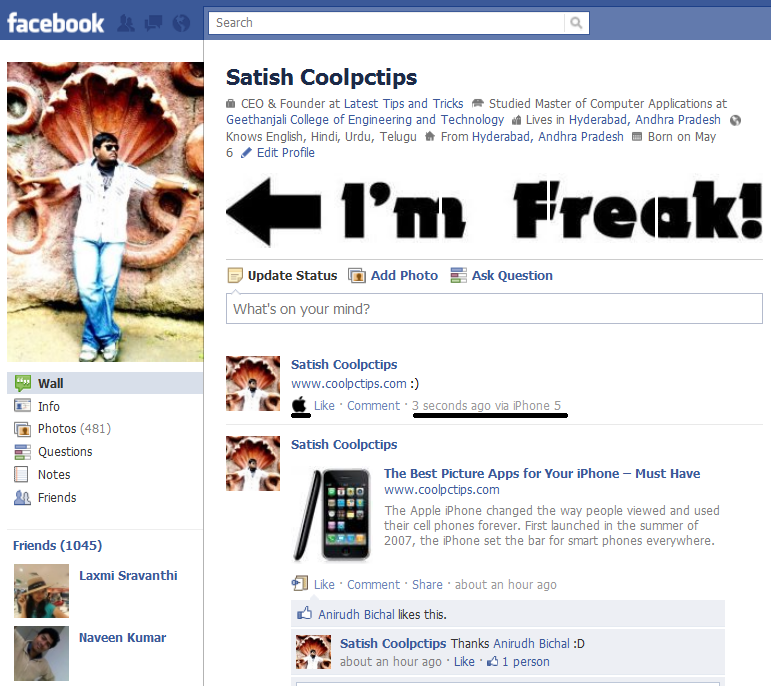 With a simple Facebook app it is possible for you to update the status from different tabs. I will show you how you do that with a detailed description. Just follow the article and the screenshots. Trust me this is real fun. Your friends will wonder how and when you have bought so many devices in less time. I love doing this with my friends and most of them will be asking me how come you have bought latest gadgets so fast. So lets have fun today and trust me you will really like it. Step 1 : All you have to do now is to log in your Facebook and make sure you are not using secure browsing HTTPS. You have to use HTTP if you want to try this app. If you open the app, it will automatically take care of it. Step 3 : You can see some options similar to the screenshot shown below. Step 4 : As you can see there is a Box where you have to enter your status and also you can see some devices to the right side. You can click anyone of the device name beside to update your status from it. Lets try the from android now. 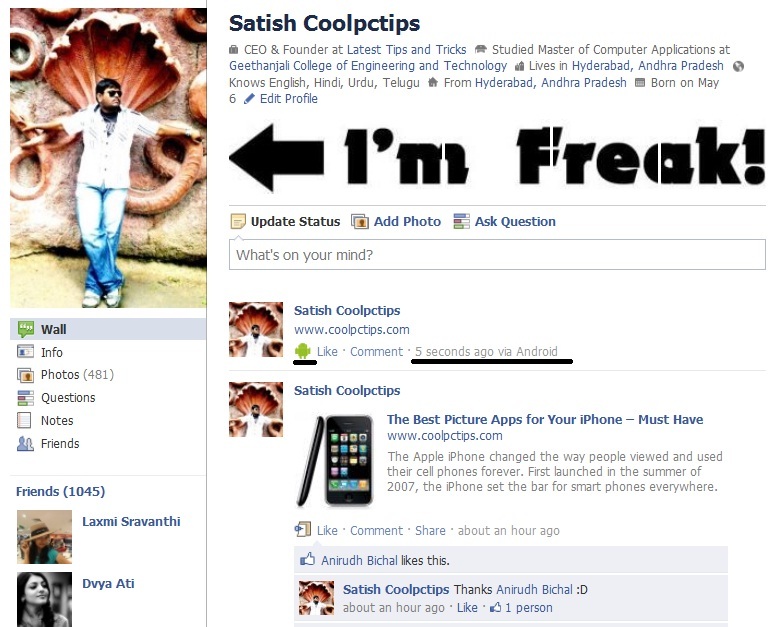 Step 5 : Now i have entered a status as www.coolpctips.com in my status and updated via android. As you can see in the screenshot that the device is listed to be android and also the time when it is posted. Step 6 : Now lets try with another device. I would like to post it with iPhone 5 which is not yet released in India. If at all you are opening the device for the first time, it will ask your permission to give access. Just click on allow as shown below. Step 7 : As you have permitted the app to perform actions, you will be notified that you can use it now. So just go to the status update box and update the status as usual. 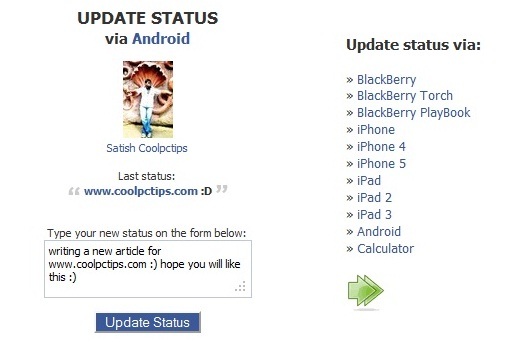 Now you can see that your status has been updated from iPhone 5. How cool is that ? See the below screen shot. Similarly you can update your status with BlackBerry, BlackBerry Torch, BlackBerry PlayBook, iPhone, iPhone 4, iPhone 5, iPad, iPad 2, iPad 3, Android, Calculator. I hope you will have fun with this simple trick. If you have any doubts on this, just leave a comment below. Article suggested by my friend Naveen Kumar who is a enthusiastic Facebook user. Try this and have fun with your friends. Please share this Facebook status from Different devices article if you liked it. Before, whenever I post status using my Android phone I will see it on my profile as “via Android” … but now it will show as “via mobile” … can i revert back to the “via Android” thing? I mean, Blackberry and HTC sense can do that, but I’ve noticed with my friends who have iPhones and Androids posting status on their walls “via mobile”? 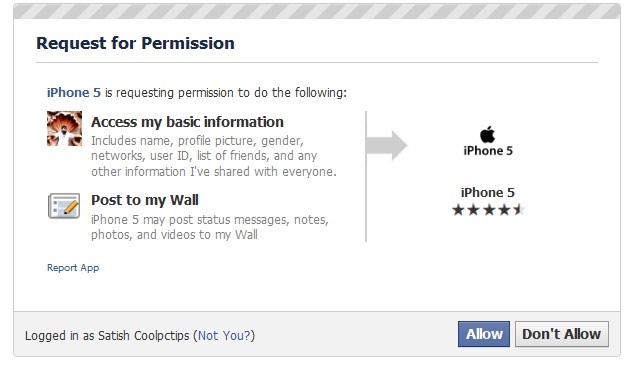 You have to allow the device to give permissions to use facebook. Check that option in facebook. I suggest you to log out your account once from device and again re try to update the status.